Red Creek Jasper was discovered in Northwestern China about 5 years ago. It is name ‘Red Creek’ after the stream that runs through the mining area. The colors and hues are out of this world. I have seen multiple shades of Red/Burgundy, Green, Browns and Yellows. Each piece is virtually different from the next. This gemstone is called Jasper but the jury is still out on this. The stone is a little softer than most jasper and so has been stabilized to harden it for use in jewelry. The stabilization process does not change the coloring, though. I read about this stone about 2 1/2 years ago in Jewelry Artist Magazine. Immediately I wanted to see it in person. 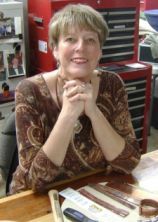 During the February 2011 Tucson Gem Show, I was able to find a few pieces and begin my journey to create awesome designs! Each time I attend this show, I purchase more of Red Creek Jasper. My passion for the array of colors and ‘images’ (yes some seem to have landscape images in them) has not waned one bit! 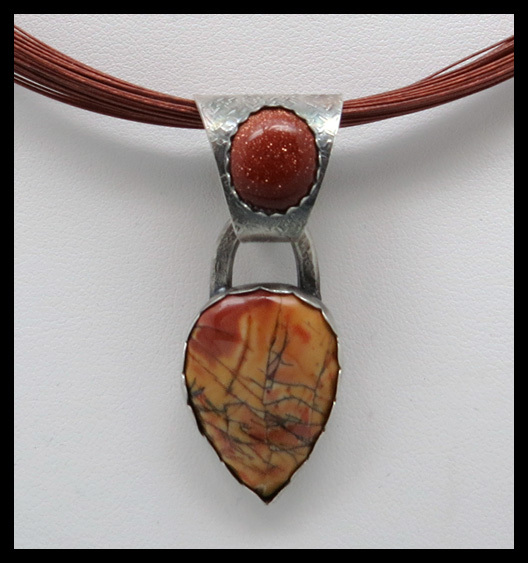 The image to the left shows one of my Gallery Pieces using Red Creek Jasper and Sunstone to bring out the red tones. The earrings to the right show off more of the green tones. Red Jasper is considered a grounding and healing stone. It affects you gradually, over time.. so wear your Jasper Piece often! See below for a rough image of the stone. This is how beautiful it is before the cutting process. I am constantly amazed at the splendor found in nature. « Somebody said it couldn’t be done….. I could not agree more! This is a beautiful stone, and I have set it in a few pieces as well. The overall appearance of the red creek jasper reminds me of an impressionist paintings. I named a pendant I made with this stone ‘Van Gogh pendant’. thanks Amy. What a great name for the Pendant. Thanks for sharing. The red jasper earrings you made are breathtaking! Thanks so much. I love them too!